Looking on a hydro pole, I saw the picture of a missing cat, and I totally understand that heartache. As any cat lover will tell you, this is one of their worst nightmares. Anything can happen to a cat once free outside, but you can compromise and build a cat enclosure! It is nice to be able to let your cat experience the outdoors, even if it is just in a limited area. So, to build a cat enclosure, would be the perfect answer. They can feel the air, and the sun and watch all the happenings going on outside. You can even join them and they can sit on your lap while you enjoy the outdoors in complete safety while you relax and read a book. You can purchase cat enclosures as kits at pet supply stores and online stores such as Amazon and US free ads, for example, but you can also build a cat enclosure yourself. You have to first decide the type of yard you have, and if you want this cat enclosure to be a part of your landscaping, or just a temporary house that you can quickly put up and take down. One of the best looking cat enclosures I have seen quickly built is one using a gazebo. In this case you can avoid the pet supply stores which tend to be expensive, and hit the home improvement stores or garden centers. You could build a cat enclosure in an afternoon. one gazebo kit of your choice. You don't need all the fancy curtaining around it, just the basic one that is the frame and the roof. This should make it cheaper. You determine the size you would like to have. chain link fencing in a roll. Go by the outside measurement of your gazebo to determine how big a roll to get. But the gazebos are usually 10 feet tall. You need to get chain link fencing to build a cat enclosure that is 11 feet tall. You need that extra foot at the bottom to fold out on the ground. One pre-made cat door. These are those doors that you would install in your house door for example. There will be a few to choose from. Get one big enough for your kitty. That shuts well and can be secured. An area that you can build this in. It is nice if you can find a grassy spot, but you can also use a deck or patio. To build a cat enclosure, construct your basic gazebo, and make sure to stake it to the ground or the deck with the included stakes. Once you have built your gazebo, check out the area, and make sure, especially if it is over the grass, that there are no ant hills, or obvious problems in under the gazebo that will bother your cat. The same if the cat enclosure is on the deck, look for any problems that could arise in that area, such as splintering wood etc. Next take your roll of chain link fencing (do not use chicken wire, as this will hurt their paws, you need proper chain link in a roll) you may need help with this part. To build a cat enclosure, you need to attach the chain link fencing at one post or support for the gazebo, using your fencing ties or plastic ties. Make sure it is secure, and make sure the extra foot of fencing is at the bottom, and you fold it to the outside of the gazebo. This, once staked down, will stop your cat from trying to dig its way out. You can fold it to the inside if you would rather, but the cats might get caught on any sharp edges, and that would not be good. To build a cat enclosure, make sure you pull the fencing tightly, and secure it to each of the supports for the gazebo. Now take some tent pegs and every couple of feet or so, secure that extra folded out part of the fence to the ground. This helps prevent the cat from trying to get out. But most cats quite enjoy these cat enclosures. Note: If you wanted them to have lots of climbing shelves in the cat enclosure it is easier to put them in first. Now decided where you will put your cat door, and install it into the fencing. You can put your cat in through this door then secure it. 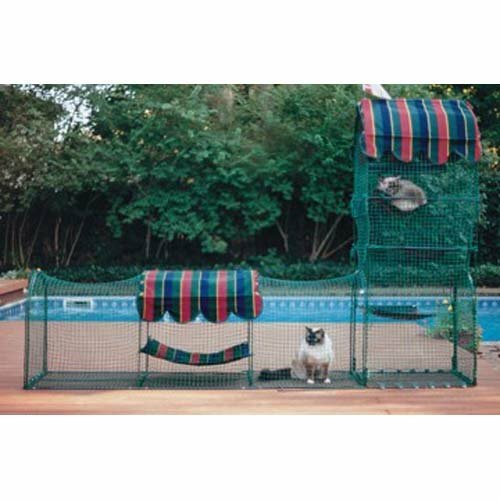 Most cats love to hang out in these cat enclosures. They are safe here from predators, cars, other cats and more. If you would like this to used by all of you, you could build a cat enclosure with a larger door or gate in the fencing. But please stay away from chicken wire, it hurts their paws, and can easily make them bleed. I have also seen these gazebos, on decks right up against the house so the cat only has to jump out a window to get in.. You can get creative with how you build these. But a gazebo is a great basic frame to use, and doesn't look like a cage the same way as some of those wooden ones do. This way there is no wood to buy, and your cats get a nice large play area. So, go ahead and build a cat enclosure for your cats and you to enjoy. You don't want to have to be posting those picture posters on hydro poles looking for your missing cat. You can also furnish these with creative outdoor climbing frames that can be left outside. A friend of mine put a large log from a tree she had cut down, in the cat enclosure she built, and the cats loved to sharpen their claws on it and play. To build a cat enclosure, using a gazebo will save you and it will look like it was part of your landscaping. You can get the chain link fencing in green to match. Get creative, your cats will love you for it! don't use chicken wire, it will hurt their paws.